The goal of Blue & YellowÂ Logic is to teach urban communities how to support themselves and the environment with this sustainability project. No back yard plots here.Â The gardens cover city blocks and provide enough food to feedÂ several families throughout the year.Â Here Cavem supervises a soil delivery to agarden managed by the Eastside Growerâ€™sÂ collective.Â The project is gaining local and national attention.Â Recently, Blue & Yellow Logic has made arrangements to develop gardens at the home ofÂ Colorado Senatorâ€™s Michael Johnston andÂ The Seanse-Elyri Â Aquaphonic Grown HouseÂ Project Â in order to provide free organic food to the community. A solar-powered art exhibit? It wouldn’t be the first time we’ve covered something of that sort on the vaunted pages of mnp, but it could be the coolest. Creating the effect of an enchanted forest of singing trees, Craig Colorusso’s “Sun Boxes” installation can be walked through in a leisurely manner, or run through at full speed in a last ditch and extremely risky move to avoid the approaching enemy. 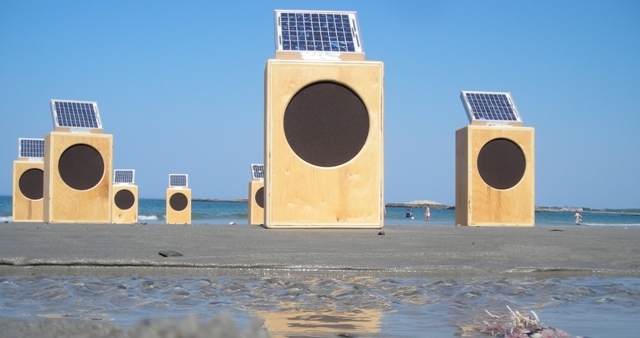 Sun Boxes is a solar powered sound installation. 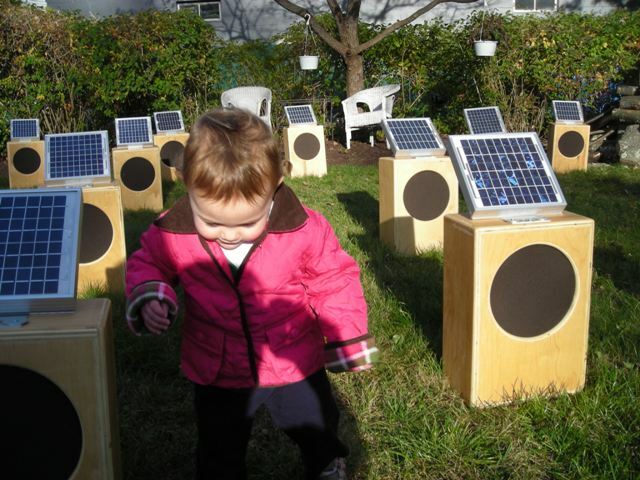 It’s comprised of twenty speakers operating independently, each powered by the sun via solar panels. Inside each Sun Box is a PC board that has a recorded guitar note loaded and programmed to play continuously in a loop. These guitar notes collectively make a Bb chord. Because the loops are different in length, once the piece begins they continually overlap and the piece slowly evolves over time. Basically, I imagine this to be one harmonious but constantly changing, amplifying, and diminishing barrage of sound that keeps on rocking (God forbid it’s cloudy out). Although not billed as such, I find this to be a potentially very interesting and mesmerizing marriage of sound and mathematics. Plus, this ninja is from Beantown! Craig will be at the IMA from March 18-20, for what we hope are 3 beautiful days. We recommend you wander amongst the enchanted sound-forest, put don’t pick the flowers! We are all reliant on the sun. It is refreshing to be reminded of this. Our lives have filledup with technology. But we still need the sun and so does Sun Boxes. 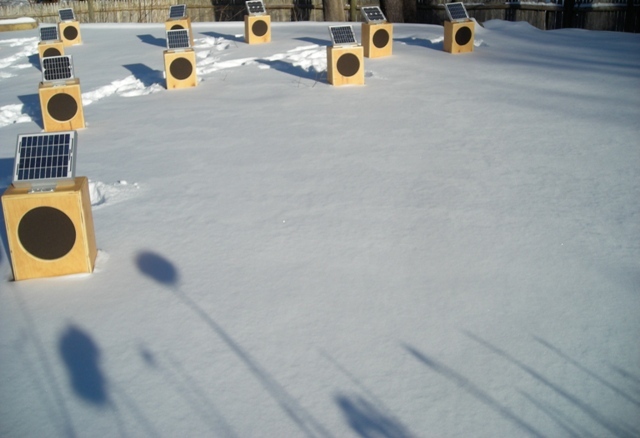 Karlheinze Stockhausen once said “using Short-wave radios in pieces was like improvising with the world.” Similarly, Sun Boxes is collaborating with the planet and its relation to the sun. An unusual bike design, â€œForkless â€“ Cruiserâ€ byÂ Olli Erkkila.He built it for his graduation project at the Institute of Design in Lahti, Finland. always good stuff from Green for All out of Oakland. Three vignettes from Copenhagen show that personal responses to the conference might be the greatest cultural happenings around. This is part two of a GOOD mini-series by the Canary Project‘s Ed Morris on the cultural happenings surrounding COP15. Such was my experience of the mass protest in Copenhagen this past Saturday. Estimates vary widely as to how many marched. Fox News says 25,000; the organizers say 100,000; and the police say 60,000. There were arrests of 968 (this number appears exact). In the media centers and on the street, more intense interest has been paid to the possibility of violence than any particular detail of the negotiations. This is understandable. In addition to our seemingly innate tendency to be fascinated and compelled by images of violence, there is the fact that the expression of violence is the one real thing happening here. The example that Benjamin gives to illustrate this point in “A Critique of Violence” is the worker’s strike – the state allows it to happen, despite its violent nature, because the power of the massed workers is sufficiently dangerous. The strike, like the protest, is violent regardless of whether it employs overt violence as a particular technique because it opposes order and the interests that constitute the state. Of course, even protests and strikes can go too far in the eyes of the state and claim a level of violence that the state cannot abide without losing authority. Protest, in both its permitted and non-permitted forms (both of which, by Benjamin’s definition, are essentially violent) is the most available and most direct negotiating tool for the 6 billion people not inside the Bella Center. Four people from different parts of the world arrive at Lykkesholms Alle 7C. They are greeted by a Danish family: husband, wife, and three boys, the youngest a baby. Also in the home are three women from Peru – two dressed in traditional highland clothing, one in jeans?and a camera crew of two people. After some small talk and a little getting to know each other, people take seats around a coffee table, others on the floor, some on chairs and a sofa. The camera crew remains standing. The children come in and out. The older of the Peruvian women asks for a photo from each person. She places the photos (given in the form of IDs) on some yellow flowers in the middle of the table, then gives each person a yellow candle. Each person writes his or her name and also his or her wishes for the next year directly onto the candle. The woman then lights each candle, muttering various incantations. She sprinkles sugar over the flowers and the photos and the candles. And then we sit and wait for each flame to burn down the wax entirely. Where we were rushing before, we are not rushing now. It is just the 14 of us in the room and the early northern darkness that presses against the window becomes a hypnotic abyss. A dinner of about 25 people in a home near the center of town: home-cooked food, arrangements of dried flowers on the table, and several bottles of wine. Many at the dinner are involved in one form or another with a labor-intensive intervention project that is calculated to have an effect on the media coverage of COP15. The dinner is a break in the preparatory work for this intervention. Again there is a camera crew filming the event. At some point, people start giving speeches. This has been planned, which surprises me, because everything leading up to it has seemed so casual. The first speech is by a scientist, who gives a long hymn to Tycho Brahe and the scientific process (truth above ideology, and so forth). He is followed by an art student talking about the power of images, who in turn is followed by a business professor on the topic of learning not to be frightened by the facts of a new world, who is followed by an artist and activist on the need to avoid the grips of institutions. Then the planned speeches end and one woman stands up and proposes that the fundamental problem with comprehending climate change is our inability to come to terms with death. She then speaks about a friend, Brad Will, who was recently shot dead during a protest. She gathers herself and sings a song the she and Will used to sing together. ? ?My karma is to good for you to worry ’bout the crazies / I love everybody and there’s nothing that I own?? cassette tape lamps via Inhabitat.